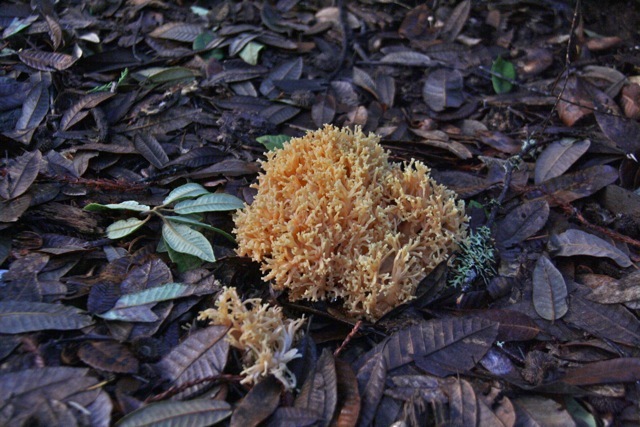 This fungus looks like a discarded bit of sea sponge or foam rubber was left lying on the forest floor. Upon closer inspection, it looks exactly like its name: yellow coral-like arms diverge and split into ever smaller branches. 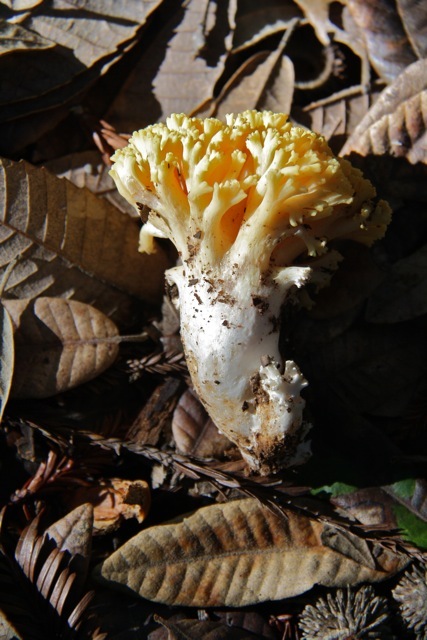 Yellow coral mushroom (Ramaria rasilispora) is the most common fungus to meet this description—though there are several others. Its lower branches and “trunk” are white, don’t stain green or brown when bruised, and are solid rather than gelatinous. It’s common throughout the west, and in our area is mainly found under tanoaks or live oaks. Interestingly this preference changes with region and elsewhere it is most often found beneath conifers, according to my field guide.